Our piece on why the 2017 Australian Flu numbers are likley to be really, honestly, no kidding around, bigger than they have been for at least 5-years. In some States. We keyboard warriors love to talk into our echo chambers, shill our bigPharma ideas to pay the rent on our Bell 429WLG and generally hear ourselves think out loud. So it’s a shock and a surprise when we get dragged out into the bright lights of realit…okay, I’m being facetious. I love to think that it’s possible to reach a bigger audience than the vast majority of scientists ever get a chance to. If there’s any possibility that I can pass along what I’ve learned – using my own voice – and help someone else understand something about viruses and their impact, then I’m more than happy to swallow the nerves and give it a go. 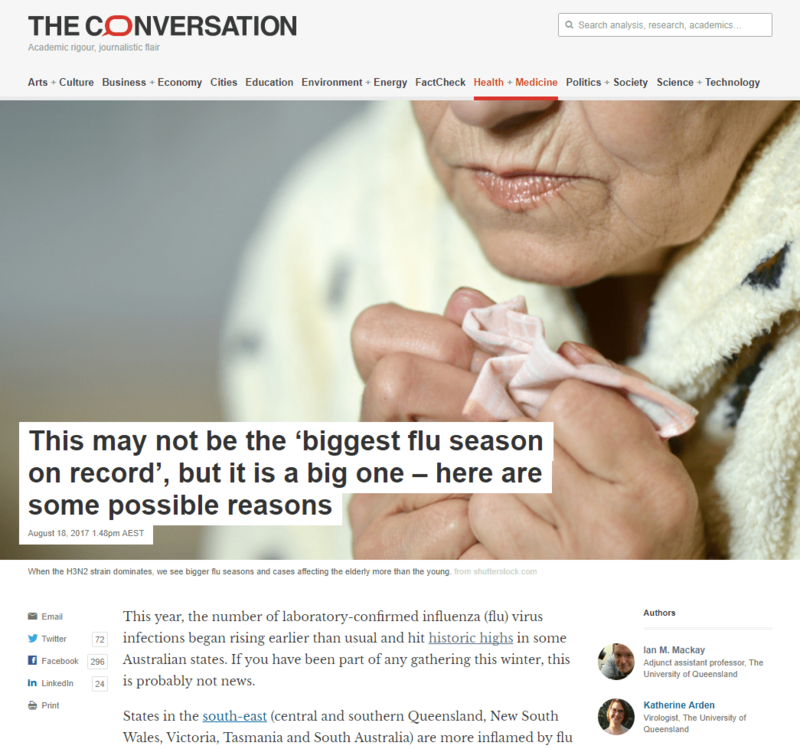 One such chance came via an Editor at The Conversation (with thanks to an opportunity from another expert who passed it along) who asked us to quickly throw together a piece with a brief focusing on whether it really was Australia’s most bigly Flu season, in response to all the media coming out with banner containing some version of “biggest ever”. My partner in crime – @kat_arden and I wrote that up and it was online a bit over 27-hours later. As of right now, the article has been viewed 74,382 times – about two thirds of that because the Australian ABC website picked it up. We’ve co-written 4 pieces for the Conversation since 2014 – none had broken 11,000 reads (so far 95,491 reads in total) so this was a pretty big communication win. That puts our writings among the Top50 University of Queensland authors (top 8%). Probably not for long! If I were to still be an active researcher, this would have gone onto my CV’s “Community Engagement” section (okay, it still did) but I’m not sure what real impact it would have made on reviewers of my grant funding request – if I still applied for such things. Oh, I noticed some grants I reviewed for national funding bodies this year made a point of asking for such details. But was it worth part of any of the scores? That might make scientists think more about engaging the public. The Conversation August Research Engagement Report shows that our piece did very well among The University of Queensland’s offerings. There were also a coupe of radio interviews (the live-to-air ones are better than coffee for getting the heart pumping) and some phone interviews which resulted in some further, quantifiable engagement. [3,4,5] A bit later I was asked to contribute to an excellent Q&A on vaccine myths that was published in the Herald Sun (HS) entitled Vaccination safety: Eight anti-vaccine myths compared with the facts. It received about 2,500 page views (1,300 via social networks) as of the 9AM, 4th of September. My thanks to Anthea Batsakis, SEO/HS, for providing these numbers). But you’ll have to ask others if you need to show evidence that these activities are “worth it” for your CV. On this one, I fall back on simple belief. I believe it’s worthwhile to continue back to the community. it doesn’t hurt to have the national broadcaster pick up your work as well! As to the underlying question of WHY was 2017 such a big Flu year in some parts (but not all parts) of Australia – I don’t know. My gut feeling is that it’s the confluence of a few factors including…. Hopefully we’ll learn more about this Flu season as time goes by. This may not be the ‘biggest flu season on record’, but it is a big one – here are some possible reasons. Flu season: Why it’s been a particularly bad year for influenza. 2017 AND THE FLU… HOW BAD IS IT AND WILL IT GET WORSE? What is the economic impact of this year’s flu season? Next → Next post: MERS & the Hajj – watch out for the Flu!